Summary: Willy Wonka famously gave away 5 golden tickets to kids so they could enjoy a private chocolate factory tour. Your tour at the Sake Museum Ponshu-kan inside Echigo-Yuzawa station won`t be private, but it`ll be a lot more fun than eating chocolate too! If you`re of legal drinking age in Japan (20 yrs. old), this is one of the best ways to spend 500 Yen in our booze-loving view. The Sake Museum Ponshu-kan inside Echigo-Yuzawa station at the gateway to Snowcountry Japan isn`t a boring informational exhibit that`ll have you looking for the exit after 5 minutes. 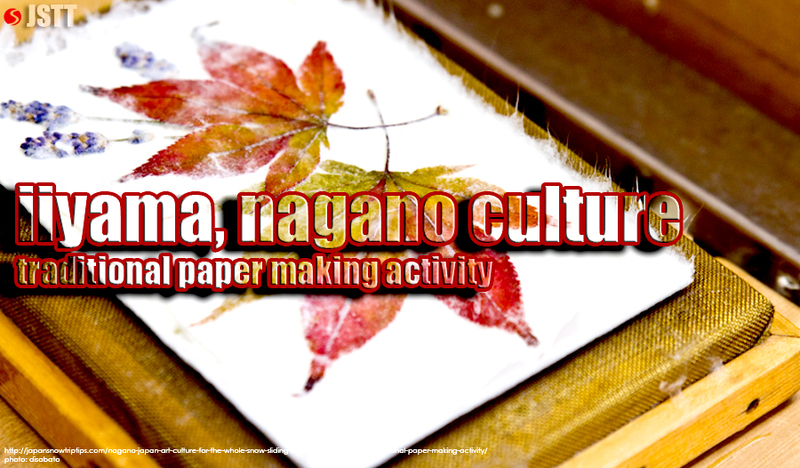 Actually, it`s more of a hands-on science center for adults. But instead of learning how static electricity works by placing your hands on a reflective metallic ball with low-voltage electricity surging through it, you`ll learn which sake varieties to smuggle home inside your luggage by tasting as many of the 100 available brands as your booze tolerance will allow. 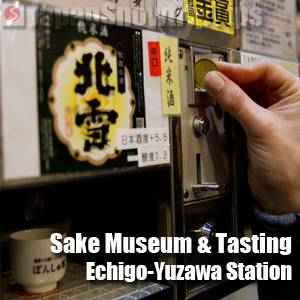 Regardless of whether you`re a connoisseur of fine sake, novice interested in finding which sake is your favorite so you can enjoy it during your stay in Japan or simply looking for a cheap buzz, the Sake Museum at Echigo-Yuzawa station is time & money well-spent. Similar to most public settings in Japan, the Sake Museum Ponshu-kan isn`t a wild raucous place with a party-time atmosphere. It`s a generally low-key, mellow environment filled with travelers of all ages (including young kids with their parents) maintaining an overall pleasant vibe. If your skiing & snowboarding trip to Japan brings you through Echigo-Yuzawa station or you`re looking for a fun rail-accessible outing from Tokyo, the Sake Museum Ponshu-kan at Echigo-Yuzawa is a great option. 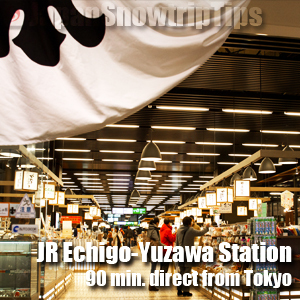 JR Echigo-Yuzawa station is located on the Joetsu Shinkansen line, less than 90 minutes from Tokyo central station. 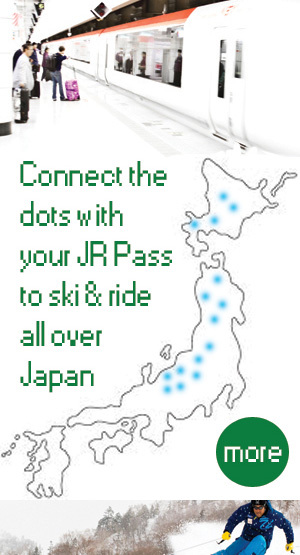 Make a free seat reservation with your JR Pass on the Toki or Tanigawa Shinkansen. After arriving at Echigo-Yuzawa station, go through the market in the central lobby, then locate the white drapery with blue kanji at the end of the main hall. Upon entering the Sake Museum, turn to your right and you`ll see the tasting area. The cost for sake tasting is 500Y for 5 golden tokens. You`ll also receive a sake tasting cup that should be returned before exiting. If you`re not a sake lover or just want to take a few sips to try different varieties, the tokens & cup can be shared with more than 1 person. 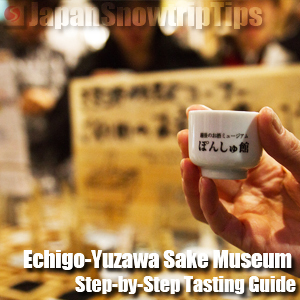 The Sake Museum at Echigo-Yuzawa station is open daily year-round, 9am-6pm (April-Dec.), 9am-8pm (Jan.-Mar.). If you`d like to absorb instead of ingest, the hot sake bath is also open daily, 10am-5:30pm (Apr.-Dec.), 10am-7:30pm (Jan.-Mar.). Sake bathing costs 800Y for adults and 400Y for children. Step 1: Locate the white drapery with blue kanji at the end of the main station lobby. Enter the museum and turn right into the tasting area. Step 2: Pay 500yen to the Sake Museum attendant. He will give you a welcoming smile, 5 golden tokens and a sake cup to be returned afterwards. Step 3: Browse the 100 hundred sake varieties along the wall! Step 4: Place your sake cup inside the sake dispenser, deposit your gold token and wait for vending machine magic to happen. Step 5: Remove the cup from the sake dispenser, then slowly and softly breathe in the aroma of your sake. Aroma is one of the major differentiators among sake varieties and plays a significant role in overall enjoyment. Some varieties will smell more “alcoholy”, akin to vodka, while others will emit soft hints of flowers, rice or other aromatic additives that make that particular sake unique. Step 6: Sip your sake slowly at first. Try to examine the subtle flavors. Step 7: Either drink your entire cup, share it with a friend or dispose of whatever you decide not to finish in the basin along the back wall behind the salt table. Step 8: Go to the salt table. Browse the numerous varieties of salt, choose one, then use the provided spoon to place a small amount in the palm of your hand. Lick the salt from your hand to cleanse your pallet. Step 9: Pull-out golden token number two and repeat until you`ve had your fill or run-out of tokens. Step 10: Be trustworthy. Return your sake cup to the designated spot, say arigato gozaimasu (thank you) to the Sake Museum attendant, then attempt to walk in a straight line to your train platform or back to your Yuzawa town hotel. Pay special attention to the sake varieties marked with top honors. These are usually excellent choices, but also don`t be afraid to just wing-it and try whichever random sake brand you like. If you can`t read Japanese characters, look for a label that catches your eye and go for it. 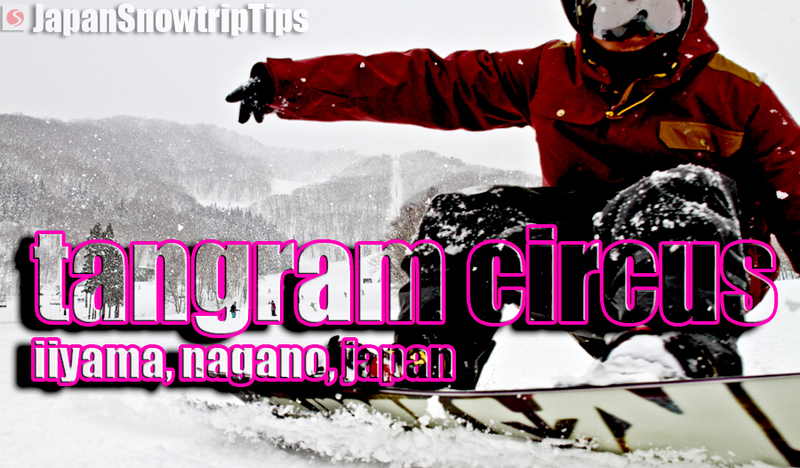 Snowtrip Tip 2: Drink it like shooters in a university bar or take your time. We recommend allowing 30-45 minutes so you can sample a few varieties, casually soak in the whole experience and have time to purchase your favorite at the end. However, if you`re a solo traveler or small group that only has 15 minutes until your next train, it`s still feasible for you to down 500yen worth of different sake and make it to your train departing from one of the near-by platforms if you hustle (presuming minimal crowds). Snowtrip Tip 3: Without the salt, your sake is sh*t.
Don`t immediately re-fill your sake cup after tasting a specific sake variety! This will ruin the sake tasting experience. Be sure to cleanse your pallet first with one of the numerous varieties of interesting salt flavors. Don`t over-do-it, just a little bit of salt is all you`ll need, but don`t omit this step. When sampling multiple types of sake, a saltless tasting experience greatly detracts from your ability to recognize the distinct flavors of each sake. Snowtrip Tip 4: Sake is everywhere in Japan, but if you find a winner, bring it home from the museum. There`s no pressure to buy any additional sake beyond what was tasted for 500Y. 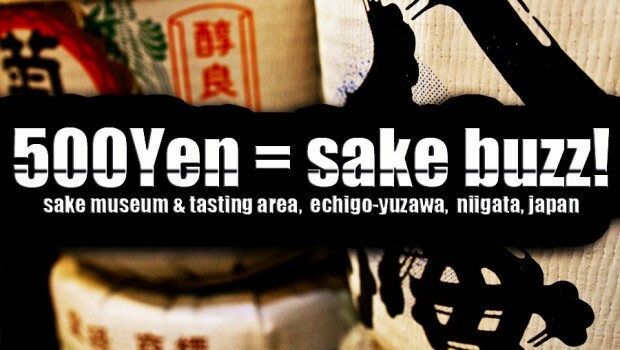 In fact, you`ll be able to find most varieties offered at markets, sake shops or grocery stores throughout Japan. Although you`ll likely pay a bit less if you buy your sake outside the museum, there`s no guarantee you`ll be able to find your favorite label again somewhere else. If you`re unsure about being able to go shopping again for your sake, don`t hesitate to buy it directly at the museum. 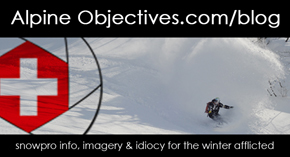 Prices aren`t outrageous and it`s a great way to conclude the experience. Snowtrip Tip 5: Perfect mountain water equals perfect sake. Our recommendation for the best sake in Japan: Hakkaisan. We suggest drinking this brand of sake directly from the source at the base of Mount Hakkai after a day of shredding blower pow at Hakkaisan ski area approximately 1 hour from Echigo-Yuzawa station in neighboring Minamiuonuma (25 min. direct JR train. to Muikamachi, then 25 min. ski bus). 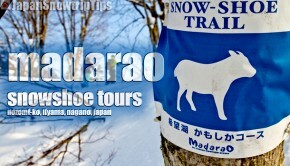 Snowtrip Tip 6: Drink it or soak in it…the sake museum has plenty to go around. If you`re not satisfied with ingesting sake down your throat try ingesting sake through every pore in your body! For 800Y you can reserve a spot in the bath and soak in a steaming sake hot spring. Not into booze bathing? No problem. But when you want to soak your aching thighs after shredding Japow like its meant to be done, first read our onsen guide for enjoying Japanese hot-springs like a local.